"The culture and people are so different, it is an eye-opening feeling to explore countries like these." Awesome experience. I would return in a heartbeat! A friend from work sent me across the link to this trip on the Exoticca website, knowing that I am an avid traveller, and it instantly appealed to me so I booked for me and my cousin to go on this adventure together! 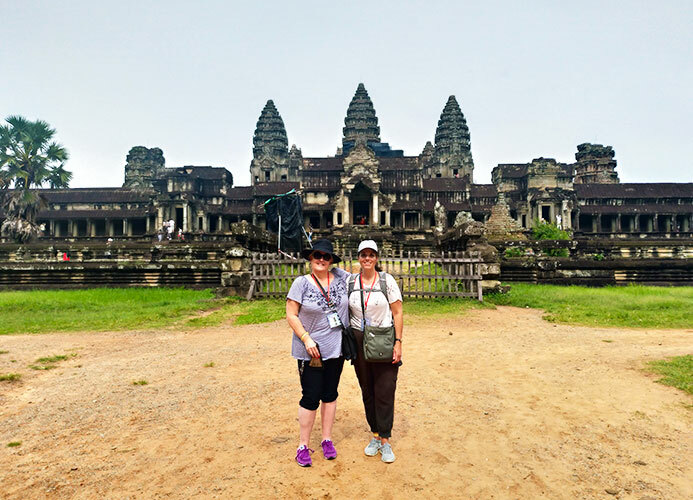 I have travelled a lot in the past to destinations such as Hong Kong, Australia and Dubai, but both Cambodia & Vietnam remained on my list so I was excited to experience Southeast Asia. I had always booked my own flights and hotels separately in the past, so this was my first time trying a package tour and I was keen to discover whether it would be the type of holiday that I could enjoy again in the future. I really wasn’t sure what to expect from Cambodia or Vietnam; I hadn’t read up much before the trip. Instead, I opened myself up to be surprised by the culture and beauty of these two destinations. The organisation of the trip was perfect, with everything running smoothly from the outset, when we were met at the airport in Siem Reap. The guides couldn’t do enough for us or the rest of the group, which were a total of 18 people by the time we got to Vietnam. The group size was really ideal as we never had to wait around for anyone and, in fact, made lifelong friends with some members of the group, who we are still messaging on what’s app now that we’re back home! The level of information and explanation given by the guides on the numerous tours was of a really high standard, and the way that they told the stories and history of the sights we visited was so accessible and easy to understand, it was a delight to listen to them. The trip was also very flexible, it didn’t feel regimented at all, which is a common fear on organised tour holidays, and we were able to do our own thing alongside the schedules visits. Cindy & her cousin at Angkor Wat. The first place to discover on our trip was Siem Reap. A bustling Cambodian city, it was probably my favourite destination out of all the wonderful places we visited. Visiting the Angkor Wat temples was an unforgettable experience and I can honestly rate it 10/10. The temples were glorious and we were even lucky enough to stop at a fourth temple on the way back, where the guide was happy to give us a tour of a relatively unknown part of the Angkor Wat complex. It was little surprises such as these that really made the trip special. Being in Cambodia, we wanted to see the iconic Cambodian Circus, famed for their acrobatic displays, and our guide organised our tickets for us to see the show whilst we were in Siem Reap, which was another memorable experience to add to the growing list! The hotel, City River, that we stayed at whilst in Cambodia was really lovely too, with an impressive rooftop pool. Our next stop was Hanoi, Vietnam, which appealed to me as being the ‘real Vietnam’, not as influenced by modernity as other parts of the country and brimming with the typical sights that you imagine when you think of Vietnam: motorbikes fill the roads and street sellers line the pavements. It is an authentic place. The guide here was fantastic and gave us detailed tours of the city. Halong Bay was a magical experience, filled with surprises and peaceful experiences. We spent the night on a boat, floating on the glistening waters of the rock-lined bay and woke early to join in a Tai-Chi practice on the deck, a lovely activity which we didn’t expect. The boat took us to lots of interesting caves and fishing villages along the bay, showing us many different aspects of life in Vietnam, alongside the plentiful natural wonders that were all around. Another favourite place that we visited was Hoi An, which is a charming, lantern-lit town with a very old-world feel to it. It was very pretty and I would urge anyone to visit it sooner rather than later as lots of building and regeneration is going on there, meaning that soon it could lose some of its charms and become a more expensive, tourism-driven town. We saw the wonderful Japanese Bridge and enjoyed learning about the history of Hoi An on the guided tour. The hotel here was my favourite out of the whole trip and had beautiful traditional decor. I fell in love with the food in both Cambodia and Vietnam, eating the local cuisine throughout the whole trip! Everywhere we ate was good quality and the ingredients they use are always fresh and healthy. On the last night, we had a big dinner as a whole group which was a memorable way to end our travels. We were also really lucky with the weather. It was certainly warm and humid but it only rained twice the whole time we were out there. The most memorable moment of the whole trip was the wonderful day we spent on the Mekong Delta excursion. We booked this at the last minute and were so glad we did as it showed us parts of Vietnam we wouldn’t have seen otherwise. 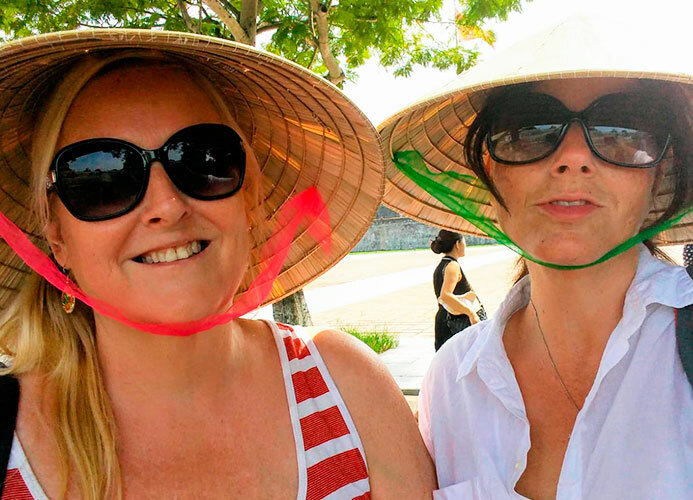 We took the trip on the last day and spent the day travelling around the Mekong Delta on boats, buses and even jeeps, visiting rural villages, a coconut press and dining on delicious Vietnamese food in the rainforest. My cousin and I honestly had such a fun time it was an unbeatable experience that won’t be forgotten! Another amazing moment was when we stopped at a road-side rice field in the countryside when we were travelling between places one day and the whole group walked into the beautiful field and just soaked up the tranquil atmosphere and the natural beauty of the landscape. To remember our time away we brought quite a few souvenirs back with us. You’re spoilt for choice in Vietnam! We both brought black pearl rings from an authentic pearl farm, so we can wear them and remember our travels. I also brought a drawing from an amazing artist in Cambodia, who had lost his legs during the war and included imagery of a wheelchair in all of his pictures; a moving reminder of the past and of the artists own personal struggle. Emotionally, I came home feeling humbled by my experiences in Cambodia and Vietnam. The culture and people are so different, it is an eye-opening feeling to explore countries like these. I would definitely revisit. Our trip was fabulous and even better than I had envisioned. 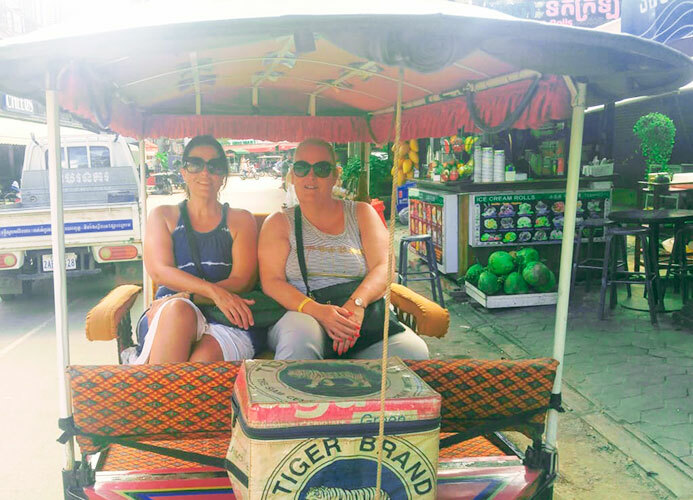 In Siem Reap tuk-tuks are fab, we hired one for 3 hours and you see so much more of the area that way and the drivers are so knowledgeable. I highly recommend the Circus and then an evening in Pub Street in Siem Reap where they have great food, drink and music everywhere and it is right next to the Night Market. Try all the traditional amazing food in Vietnam and just embrace all it has to offer. 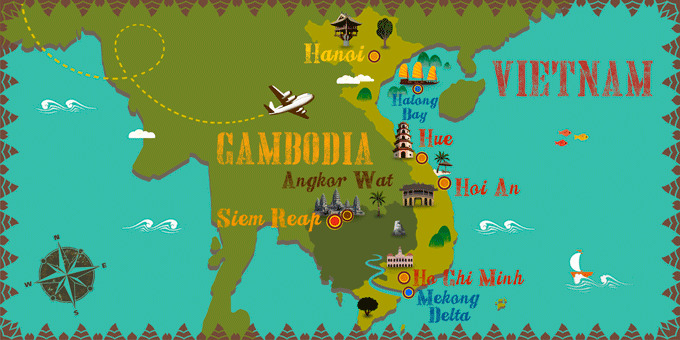 Cambodia is a travel destination where there is still much to be discovered. Open to tourism in fairly recent years, the country is already well known for the Angkor Wat temple complex. The main reason to visit Cambodia previously was a chance to explore the place where the gods designed a visionary city. Simply witnessing a sunset against the profile of the sacred tower of Bakan, reflected in one of the Baray pools in the complex, will make your visit to the country worthwhile. While you are there, however, Phnom Penh, the capital, may just seduce you with its French colonial style neighbourhoods, with beautiful Art Deco buildings at the confluence of the Mekong and Tonle Sap rivers.